Do you wonder how a major university can validate your 10-page examination paper and give you the results within few minutes? Remark Classic OMR has been a trend on different government entities and educational institutions because of the convenience the software provides. It can greatly help you on data gathering, analysis and interpretation with the use of Optical Mark Recognition that easily recognizes a filled out pre-defined template in order to give you the accurate data you need in the shortest time possible. 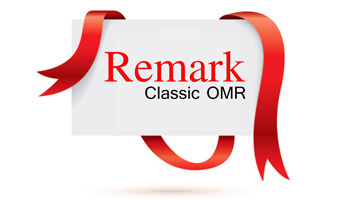 The Remark Classic OMR software works with a supported OMR reader to read and process your forms. Remark Classic OMR recognizes data from OMR fields (bubble fields). For Pearson Assessment and Sekonic scanners, the software also supports the optional barcode reader and the transport printer. Built in exception handling easily locates and allows you to correct or verify any erroneously marked forms (i.e. a person fills in two marks for a question, or fails to answer a question). Once your forms have been read and processed, the software can save the data to one of over 35 different output formats for use with virtually any analysis package (such as SPSS, dBase, Access, Excel or ASCII). Remark Classic OMR can even save your data to an ODBC compatible database. Or, save your data in Remark Classic OMR's own format and take advantage of the software's built in analytical tools. Do you wonder how a major university can validate your 10-page examination paper and give you the results within few minutes? Remark Classic OMR has been a trend on different government entities and educational institutions because of the convenience the software provides. The Remark Classic OMR® software scans and processes data from tests, assessments, surveys and other forms. The software is combined with an OMR (Optical Mark Recognition) reader to recognize filled-in marks on forms (“fill in the bubble” forms), which automates the data collection process.